The wireless power transmission (WPT) refers to the efficient transmission of electric power from one point to without use of wire or any other substance. This technology can be used where conventional wires are unaffordable, inconvenient, expensive, hazardous, unwanted or impossible. It can also be used for applications where either an instantaneous amount or a continuous delivery of energy is needed. The power can be transmitted using microwaves, millimetre waves or lasers. WPT is a technology that can transport power to locations, which are practically impossible to reach. Maxwell’s theory of electromagnetism was published in 1865 which stated that electromagnetic waves travels at the speed of light, and the light is itself just such a wave. In 1886 Hertz successfully performed a experiment with pulsed wireless energy transfer. He produced an apparatus which produced and detected microwaves in the UHF region. 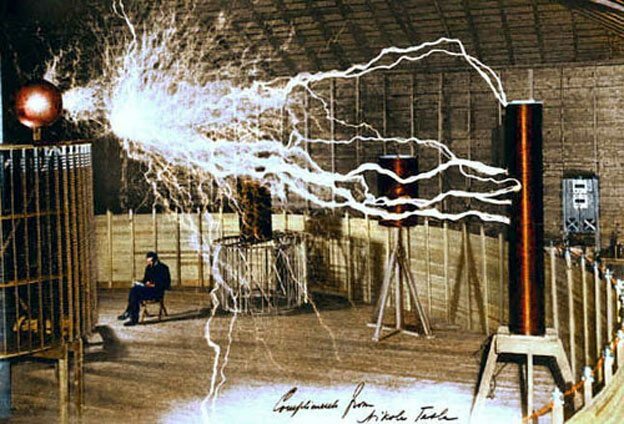 In 1899 Tesla performed experiments in the field of pulsed wireless energy transfer. 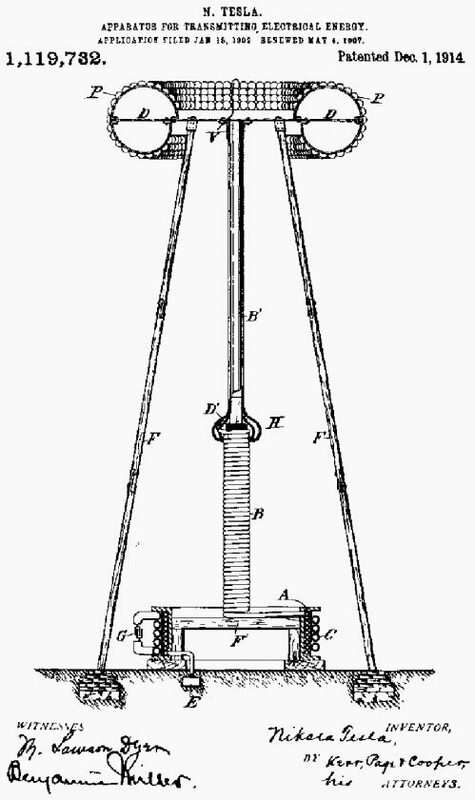 Tesla’s Magnifying Transmitter, an early type of Tesla Coil that measured 16 meters in diameter, was able to transmit tens of thousands of watts without wires. The Famous Tesla Tower erected in Shoreham, Long Island, New York was 187 feet high, the spherical top was 68 feet in diameter. 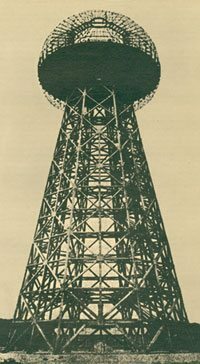 The Tower, which was to be used by Nikola Tesla is his “World Wireless” was never finished. In 1897, he filed his first patents dealing with Wardenclyffe tower. This tower was supposed be a pilot plant for his “World Wireless System” to broadcast energy around the globe. But he was not able to make it fully operational due to economic problems. The Raytheon Company performed the first successful WPT experiment in 1963. During that experiment energy was transmitted with a DC-to-DC efficiency of 13%. In1975 the Jet propulsion lab of NASA carried out an experiment and demonstrated the transfer of 30 kW over a distance of 1 mile using an antenna array erected at the Goldstone facility. This test proved the possibilities of wireless power outside the laboratory. Rockwell International and David Sarnoff Laboratory operated in 1991 a microwave powered rover at 5.86 GHz. Three kilowatts of power was transmitted and 500 watts was received. Electricity is needed to be transformed into a suitable energy form for its transportation. For wireless transmission, this has to be a form that can travel trough air. Microwave frequencies hold this ability. The microwave spectrum is defined as electromagnetic energy ranging from approximately 1 GHz to 1000 GHz in frequency, but older usage includes lower frequencies. Most common applications are within the 1 to 40 GHz range. The components include a microwave source, a transmitting antenna and a receiving antenna. The microwave source consists of an electron tubes or solid-state devices with electronics to control power output. The slotted waveguide antenna, parabolic dish and microstrip patch are the most popular types. Due to high efficiency (>95%) and high power handling capacity, the slotted waveguide antenna seems to be the best option for power transmission. The combination of receiving and converting unit is called rectenna which is a rectifying antenna that is used to directly convert microwave energy into DC electricity. Rectenna includes a mesh of dipoles and diodes for absorbing microwave energy from a transmitter and converting it into electric power. Its elements are usually arranged in a multi element phased array with a mesh pattern reflector element to make it directional. One of the disadvantages is that microwaves have long wavelengths that exhibit a moderate amount of diffraction over long distances. The Rayleigh criterion dictates that any beam will spread (microwave or laser), become weaker, and diffuse over distance. The larger the transmitter antenna or laser aperture, the tighter the beam and the less it will spread as a function of distance (and vice versa). Therefore, the system requires large transmitters and receivers. The used power density of the microwave beam is normally in de order of 100 W/m2. This is relative low compared to the power density of solar radiation on earth (1000 W/m2) and chosen this way for safety reasons. Using a powerful focused beam in the microwave or laser range long distances can be covered. There are two methods of wireless power transmission for bridging application. First is the direct method, from transmitting array to rectenna. A line of sight is needed and is therefore limited to short (< 40 km) distances. Above 40 kilometers, huge structures are needed to compensate for the curvature of the earth. The second method is via a relay reflector between the transmitter and rectenna. This reflector needs to be at an altitude that is visible for both transmitter and rectenna. This method is not discussed further. Next three bridging applications of WPT are discussed. The largest application for microwave power transmission is space solar power satellites (SPS). In this application, solar power is captured in space and converted into electricity. The electricity is converted into microwaves and transmitted to the earth. The microwave power will be captured with antennas and converted into electricity. NASA is still investigating the possibilities of SPS. One of the problems is the high investment cost due to the space transport. The long-term exposure to low levels of microwaves might be unsafe and even could cause cancer. The scientific research indicates that heating of humans exposed to the radiation is the only known effect. There are also many claims of low-level non-thermal effects, but most of these are difficult to replicate or show unsatisfying uncertainties. A clearly relevant bio-effect is the effect of microwave radiation on birds, the so-called “fried bird effect”. Research is done on such effect at 2.45 GHz. The outcome showed slight thermal effects that probably are welcome in the winter and to be avoided in the summer. Larger birds tend to experience more heat stress then small birds. In today’s advancing world “Wireless Power Transmission” is highly intended. But at the same time other safety factors must not have been compromised. How can build Tesla’s Magnifying Transmitter, and change world climate (Technical map). 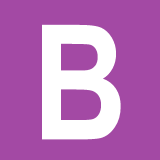 Im 3rd year electrical engg student…Im trying to build my practical knowledge with ur articles. Thank you very much!! EEP is created for this purpose, education and learning, so I’m really glad to hear that you find it usefull! If you have any suggestion or remark, please write it down. my question is whether in wireless power transmission there is some improvement in efficiency or is it the same as before??? so is there change in efficiency till today or it’s the same as before..